OVERLAND PARK — Imagine traveling hundreds of miles to spend a hot and sunny weekend in Mexico City — in a women’s shelter and a city dump. While not a typical weekend getaway, that’s exactly what a group of seven doctors and their families did in Mexico City during a weekend mission trip May 10-13. An earlier pilgrimage to Mexico City with the adult catechetical program School of Faith was what first interested Randy Brown of Queen of the Holy Rosary in Wea in a collaboration with Hope of the Poor missionary Craig Johring, who lives and works with street children in Mexico City. As president of the Kansas City Guild of the Catholic Medical Association, Brown is part of a tightly woven community of Catholic medical professionals in the area. First Saturdays is a fraternal spiritual program for physicians and their families through CMA. It was through this fellowship that Brown invited the doctors and their families to go on mission in Mexico City. The mission began with a brief pilgrimage to the Basilica of Our Lady of Guadalupe. “Seeing the tilma was amazing and impactful,” said Gerry Malnar, a parishioner of the Church of the Ascension in Overland Park, who was accompanied on the mission by his wife Terry and two sons. Prayer to Our Lady continued in the days that followed as the group visited a city dump, as well as a shelter for nearly 400 homeless elderly women. “One thousand people work in the city dump and live there,” said Brown. And due to changes in animal protection laws in Mexico City, animals are no longer allowed to carry waste up the mountains of garbage in the city dump — so humans do it. As soon as Terry Malnar heard about the mission trip, she knew she wanted to go with her family. She wasn’t sure what to expect, however, and was nervous starting out. “I was really concerned, especially at the dump, about the smell and getting sick,” she said. “And then I got there, and I didn’t notice any smell at all. And, I mean, we were in a city dump! 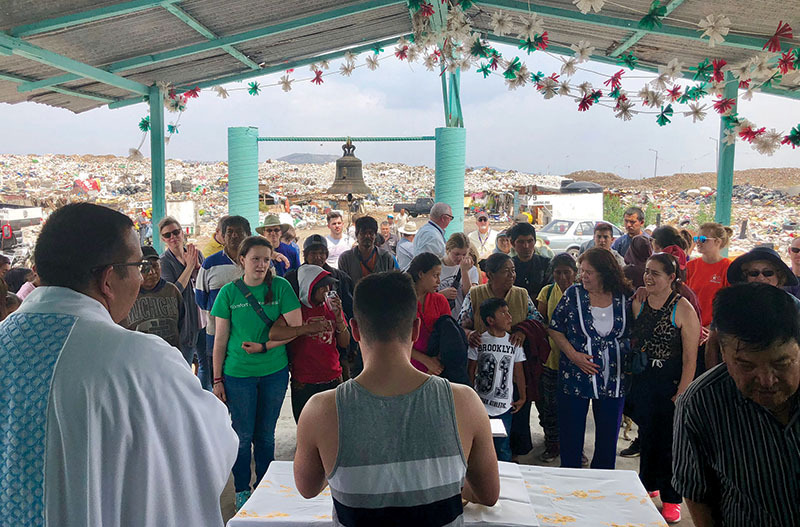 The group attended Mass in a chapel called Cristo de los Humildes, or “Christ of the Humble,” which was made from the garbage in the dump, including a reclaimed crucifix. Anna Brown, a student at St. James Academy in Lenexa and daughter of Randy Brown, also experienced apprehension approaching the mission, but felt it dissolve once they arrived at the shelter for elderly homeless women. Some in the group brought instruments and filled the afternoon with music and dancing. The visit to the women’s shelter evoked the same sense of community, but it was also difficult. “That was a hard experience,” said Gerry Malnar. “Even as a physician, it was hard to watch and see . . . a lot of marginalized women who have no families to take care of them. “Being a gynecologist by training . . . I [participated] in a conversation trying to help a particular resident there. This human connection was possible across the language barriers. “I can’t even speak the language,” said Randy Brown, “but when I was handing a burrito [to someone], I could feel their hand — there’s a contact there and a compassion in the eyes that’s hard to explain. Gerry Malnar found the trip’s encounters with the poor to be experiences of hope rather than despair. “It took a while for us to wrap our heads around the fact that that really wasn’t why we were there. The fact that the mission was made within the context of family made the experience even more profound to the pilgrims. “When you . . . see that kind of poverty together, [it] helps you grow closer,” agreed Anna Brown. Most striking to Randy Brown was the gratitude that was present even in the midst of the mission.